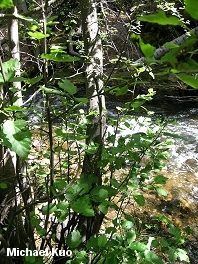 Small tree growing along western mountain streams; leaves coarsely toothed, 2-4 inches long, stretched-oval, with 6-9 pairs of veins. 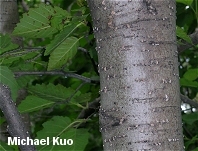 Habitat: Found in western North America along mountain streams, or around mountain lakes and bogs. Stature: Up to 30 feet high; trunk to 8 inches in diameter; when mature featuring a narrow, rounded crown. 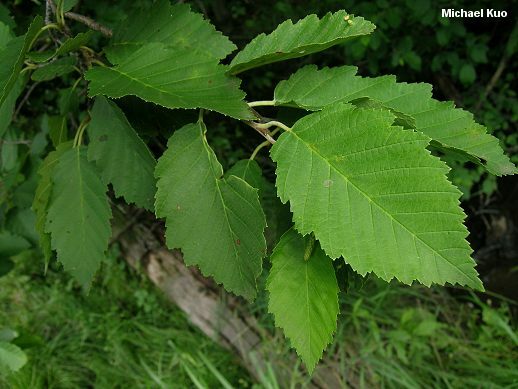 Leaves: 2-4 inches long; simple; sometimes very slightly lobed; coarsely and doubly toothed; dark green above; paler below; with 6-9 pairs of veins. 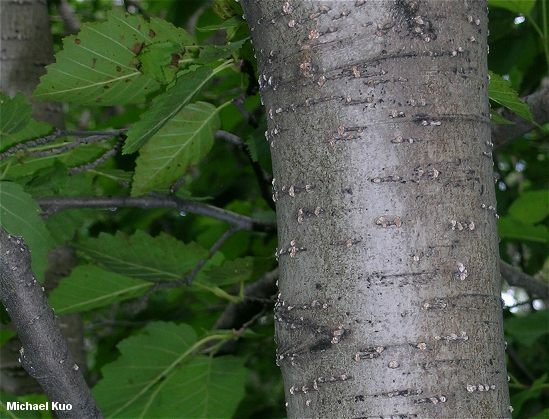 Bark: Thin; smooth when young, becoming a little scaly; gray to reddish brown. 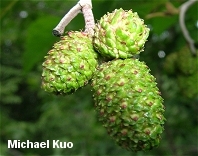 Fruit: A tiny, nearly circular nut; cones up to about 1/2 inch long. Many mycorrhizal species, especially in the genera Lactarius (including Lactarius glyciosmus) and Russula; also saprobes in Mycena (including Mycena haematopus var. cuspidata, Mycena roseipallens, and Mycena alnicola); and Psathyrella.